My new workflow for writing academic papers involves Jupyter Notebook for data analysis and generating the figures, Markdown for writing the paper, and Pandoc for generating the final output. Works great ! future proof. I do not want to depend on a file format that might become obsolete. one master file for all kind of outputs (PDF, DOC, but eventually HTML, etc…). able to deal with citation management automatically (of course). able to update the paper (including plots) as revisions are required, with a minimal amount of efforts (I told you I was lazy). open source tools is a bonus. strongly binded to my data analysis workflow (more on that later). After playing around with a couple of tools, I experimented with a nice solution for our latest paper, and will share it here in case anyone else in interested. This particular paper was particularly suited for my new workflow. What we did was data mine 120+ papers for process parameters and properties of materials to extract trends and look at the relative influence of the various parameters on the properties of the material. The data in that case was a big CSV file, with hundreds of lines. Each data point was labelled by its bib key (e.g. Deville2006), which turned out to be super convenient later. document how the analysis was done (future proof). The mix of Markdown, LaTeX, and code is a game changer for me. ability to easily change the format of the output (plots) depending on the journal requirements and my own preferences. ability to instantaneously update plots in the final paper with new data. As I run the notebook, the figures are generated and saved in a folder. ability to share how the analysis was done, so as to provide a reproducible paper. The notebook of our latest paper is hosted on FigShare along with the raw data, with its own DOI (you can cite it if you reuse it). ability to generate the bibliography automatically. As each data point in my CSV file comes with its bib key, I can track exactly which references were used for a plot. This was particularly useful when writing that particular paper. After each plot, where data are coming from many different papers, I can generate a list of the bib keys used for the plot, and copy/paste that list into the paper. Boom ! All the analysis was done in a Jupyter notebook, that I uploaded later on FigShare when the paper was published. The notebook is generating the figures with a consistent style, as well as the bib keys list. This turned out to be the biggest time saver here. To give you a rough idea, here is the simple function that I use to generate the list of bib keys. And here is the result when I run it for a figure. Now I just have to copy this list and paste it directly into the Markdown file of the paper. Very cool. I am a big fan of LaTex for long documents (PhD manuscript, etc. ), but not so much for regular academic papers. I am not a physicist, so my papers are usually light in terms of maths. I chose to write everything in Markdown, which is something like LaTex for dummies. It is a very, very simple markup syntax, very popular for blogging, among other uses. The files are plain text files, which is certainly the most future proof solution that I can think about. The syntax is dead simple, you will get it in literally 5 minutes. I do all my writing in Sublime Text, boosted with a couple of packages. Of particular interest in this case: SmartMarkdown, and PandocAcademic (not mandatory, though). I use Mendeley for my reference managements. My favorite function is the automatic generation of a bib file, which I can use for my LaTeX or Markdown writing later on. Pandoc takes the paper.md file, the library.bib file for the bibliography, and use citeproc and the iop-numerics.csl file for formatting the bibliography, and create the paper.docx file for me. Easy ! So I have everything I need now. Here is how it works. The Jupyter notebook generates the figures and saves them in a folder. The Markdown file starts with a few YAML metadata, that I use to provide the title, authors, affiliation, and dates. abstract : Ice templating, also known as freeze casting, is a popular shaping route for macroporous materials. bla bla bla. We hope these results will be a helpful guide to anyone interested in such materials. the text itself is formatted in Markdown. Take note how the citations are used in the text. Markdown use relative references to folder and files, take note how I point to the figure file. Ice templating, or freeze casting[@Deville2008b], has become a popular shaping route for all kinds of macroporous materials. The process is based on the segregation of matter (particles or solute) by growing crystals in a suspension or solution (Fig. 1). After complete solidification, the solvent crystals are removed by sublimation. 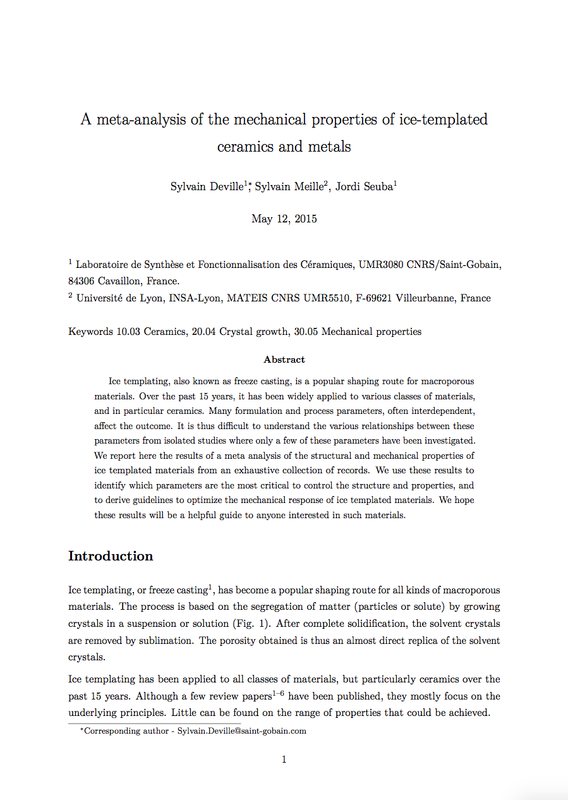 The porosity obtained is thus an almost direct replica of the solvent crystals. Ice templating has been applied to all classes of materials, but particularly ceramics over the past 15 years. Although a few review papers [@Deville2008b; @Deville2010a; @Wegst2010; @Li2012b; @Deville2013b; @Fukushima2014, @Pawelec2014b] have been published, they mostly focus on the underlying principles. Little can be found on the range of properties that could be achieved. Here is how the PDF looks like. You can build from the command line. You can also do everything from Sublime Text. Just set the user settings of the SmartMarkdown package to automatically use the bib file (generated by Mendeley, for instance) and the CSL file (depending on which journal I submit to). You can also provide Pandoc with a LaTex template if you want to. To build the final version, I either run Pandoc from the command line, or hit Maj+Cmd+P in ST and « Pandoc: render PDF », and Pandoc generates the final document for me, with the correctly formatted bibliography and the figures in place. That’s it ! I also saved the pandoc command line argument (as a text file) in the folder where the markdown file is, so that I do not depend on Sublime Text in case I change my mind, and do not have to remember the exact command line to type (lazy, I told you). A valid Python and Jupyter notebook installation, if you are doing your data analysis with it. A bib file for your bibliography. CSL file for the bibliography styles you want to use. Get the one you need here. A text editor. Many choices available. It took a while to get everything in place and working, but I am happy with it now. This workflow was particularly suitable for this paper, since all the data analysis was done in the Jupyter notebook and there were many citations (in particular for each plots) that I did not wanted to input manually. During the review of the paper, one of the referees mentioned a couple of papers that we did not found initially. I updated the CSV file with the new data plots, ran the notebook, and the figures were instantaneously updated. Rebuild the final file from the updated Markdown file, and boom. Very little friction indeed. A common question is the co-writing/proof reading when the paper is collaborative. In that case, I wrote almost everything. The other authors just sent me their parts in plain text and I pasted. I used the PDF for proofreading, and everyone annotated the PDF files. If I am in charge of the paper, I choose the tools. Deal with it. I still have to copy/paste the list of bib keys corresponding to the figures in the Markdown files. Ideally, the list would be automatically generated within the Markdown file, so that there is even less friction in the whole process. I am not quite sure how to do this. Any suggestion is welcome. If you want more control of the pagination of your output files, you can tell Pandoc to use a template (many journals provide LaTeX templates, for instance. At least in physics). I did not try, as the pagination requirements for submission are very minimal. The whole idea of a master text file is to *not* have to deal with these sort of things. Finally, some version control (e.g. with GitHub) would be nice. I forgot to mention the main limitation (for me) of this approach: Pandoc does not do cross-references. The impossibility of automatic references to figures and equations is thus the main limitation. That is a trade-off that I can accept for now, as I usually have a limited number of equations and figures. Overall, I prefer to save time on reference management than on cross-references of figures and equations. YMMV. This entry was posted in Uncategorized and tagged LaTeX, markdown, pandoc, papers, software, tools, writing by Sylvain Deville. Bookmark the permalink. I’m mostly an R programmer, so I’ve been doing mostly similar things with RStudio / knitr / rmarkdown / pandoc. I’ve seen so many people using Jupyter, though, that I decided to give it a try. However, I’m less sanguine about Markdown than many. As long as I’ve bitten the LaTeX bullet anyhow, my opinion is that you might as well just install LyX and get the whole enchilada – outliner, WYSIWYM editing, child documents, indexing, and literate programming / reproducible research in Python / R via code chunks. How would you use this workflow with, for example, BioMed Central’s tex template? You would have to edit it first right? Simply telling pandoc to use the .tex they provide would’n work, right? in principle, you could just tell pandoc to use the tex template, it should work. I never tried, though. I was introduced to IPython Notebook 2 years ago through my young colleague in Bay Area. Since then I am exploring various possibilities. I lack backgound in html, md, etc and could not reproduce the framed setting of a figure with its caption in your paper posted at IOPScience. Will you kindly share with me the corresponding markdown and code windows? Another extension I wish to add to the markdown section of jupyter notebook is use of Scholarly HTML. It can add referencing, indexing, etc. almost like your workflow. I have not explored this possibility yet. Hi, have you some experience with https://github.com/lierdakil/pandoc-crossref already? I am currently using pandoc-crossref for a manuscript combined with the approach here, and it is quite good for cross-reference. Thanks for posting, but does your approach work with IEEE templates! Ok, it was not clear from the webpage, that you need either three dashes, or three dots, surrounding it. Thank you. I have noticed that Mendeley does not automatically generate citation keys. You have to validate every new document detail in order for the citation key to be generated.